Place chicken strips on a temp-tations® Lid-It® and cook according to package directions. Carefully cut each strip into 1-inch pieces. Cut an "X" on to of each carrot to make it easier to push through the skewer. 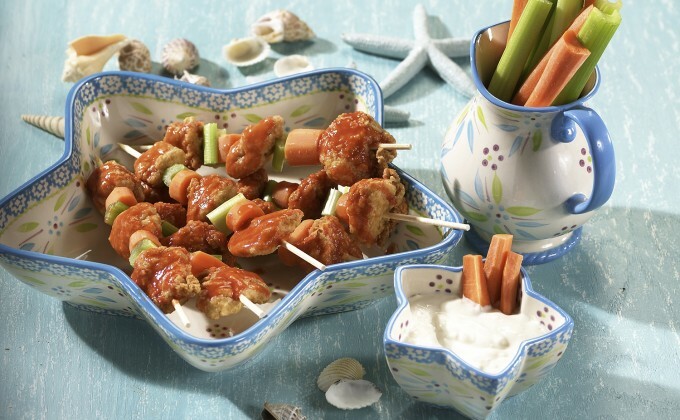 Starting with a celery chunk, fill each skewer with celery, chicken and carrots. Lay in your star baker for serving along with a small dish of blue cheese dressing for dipping.